Make her a Mother’s Day card she’ll cherish forever. Choose a notepad that's just her style. Make it sing with a personal touch. Say "thanks for everything" by helping her say "thank you" in her own style. 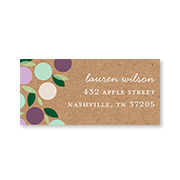 Our personalized address labels address your envelopes in style. Mother’s Day is just around the corner. Looking for the perfect way to show your mom just how much you love, respect and admire her? 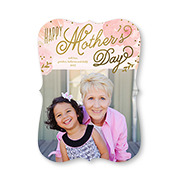 This year, celebrate your mom, mother-in-law, step-mom, grandmother or a mom figure in your life with these heartfelt and personalized Mother’s Day gift ideas. Celebrate Mother’s Day in style by giving her heartfelt gifts she will love. Create a personalized Mother's Day photo book from Shutterfly, full of your memories together through the years. If you have a few particularly special photos of the two of you, create a coffee mug that will ensure she wakes up every morning to your smiling face, no matter how far away you might be. She will savor every sip with her Shutterfly photo mug. Both easy to make and delightfully fun, personalized ceramic mugs and travel mugs are sure to be well-used and well-loved. Many moms love jewelry, especially when it comes from their children. Shutterfly has a personalized jewelry collection that ranges from necklaces and bangles to bracelets with charms. Available in stunning gold and sleek silver, customize your jewelry gift with meaningful photos, initials or birthstones. Your mom is sure to treasure this heartfelt, one-of-a-kind keepsake for years to come. When in doubt, send a sensible gift like a personalized candle. They make a delightful gift for anyone—they are cozy and create a warm ambiance in any space in the home. Choose from luxurious Evergreen Forest, Fireside Spice, Garden Bouquet, Grapefruit Blossom and Ocean Breeze scents. Moms love to save the charming and creative mementos their children give them throughout the years. Remember the piggy bank you made for her in third grade? She probably still has it. The kids Mother’s Day cards you have given her every year since childhood? She definitely still has those. Add to the pile and keep her memory drawer up-to-date with a sentimental and personalized Mother’s Day card from Shutterfly. We think that Mother's Day should be every day, but since it only comes once a year, give her something personal and heartfelt. Mother's Day photo cards and stationery gifts are a surefire way to make her day a happy one. 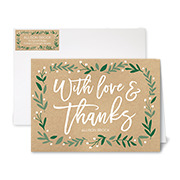 Check out our selection of thank you cards for her, notepads for her and other Mother's Day gifts. One thing is for sure: we have something for every mom. 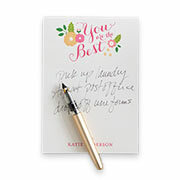 Jot down your notes on this personalized notepad. Just add your name and you're done. Makes a great gift, too.